One of Hayao Mizayaki's greatest gifts as a filmmaker is his knack for crafting coming-of-age tales we haven't seen before. Aside from his famed fantasy element, Mizayaki's hero's journeys involve characters typically a few years younger than we're used to seeing in the coming-of-age genre who must simultaneously mature whilst holding steadfastly to their childlike sense of wonder. Similar to the way that the two sisters in My Neighbor Totoro literally laugh or scream childishly before walking into a darkly foreboding room, frequently his young protagonists must navigate their way through terrain that would test most adults. And instead of preparing themselves purely for the next phase of their life or the acceptance of a major change from someone taken away or someone added to their lives, Mizayaki's character's come to the ultimate realization that their stubborn youthful optimism, love, imagination, passion and joy will be their guide through it all. 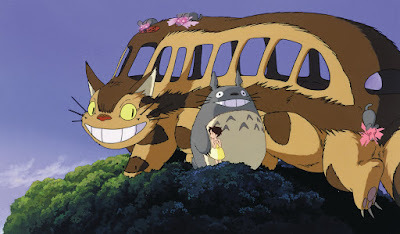 Deceptively as simple as the idyllic country surroundings a professor and his two daughters move into at the start of the movie, My Neighbor Totoro turns out to be not only uniquely moving, emotionally rewarding and genuinely celebratory of the spirit of youth but also one of what I personally feel are the strongest animated coming-of-age works ever made. 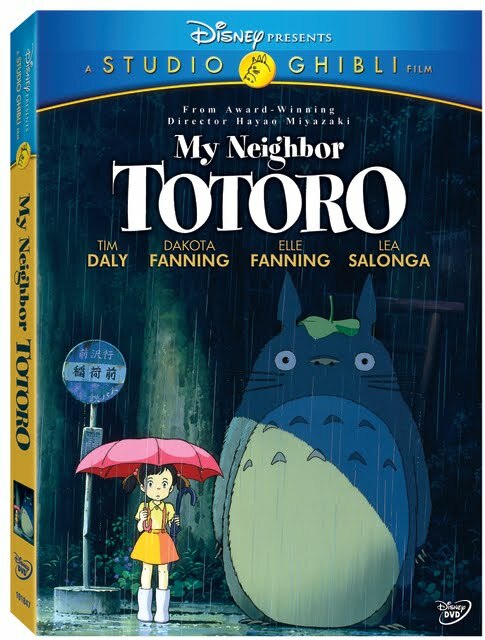 While this may not come to your attention during your first screening of Totoro, when you begin contemplating how much careful restraint was made to avoid easy answers and shortcuts in the film by Miyazaki and his colleagues at Studio Ghibli, you realize you've just seen something not only extraordinarily rare but extraordinarily special as well. When the girls come face to furry face with what their father calls the house's “soot gremlins” that scurry away as soon as the girls enter one of the rooms of their new home in the country, they begin imagining that they've landed in a haunted house. 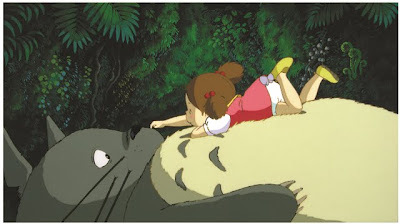 Yet as it turns out, the sea of tiny creatures that leave black soot on the ground are only a dusty herring as soon, Mei (Elle Fanning) meets a large forest creature-- a woodland spirit that can only be seen by children whom they call Totoro. Since Satsuki (Dakota Fanning) is at school most of the time and spends the rest of it growing up much too quickly by filling in as a mother figure for their own mother whom they've moved closer to be near as she convalesces in the hospital, it takes awhile for Satsuki to see her adoring sister's new friend. 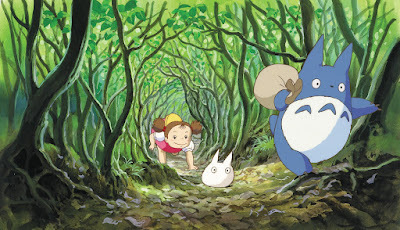 However, as the girls cope with life in the farming community where their father makes a long commute to and from Tokyo University's archaeology department everyday, they discover that Totoro is just one facet of the extraordinary world just below the everyday surface. This awareness occurs when they hitch a ride on the “cat-bus” just when they need it most as their new friend helps bring the family closer. With real life Fanning sisters playing the two animated ones, extra warmth comes through the voices alone and siblings-- whether you have a sister or a brother-- will no doubt enjoy the amount of effort that went into the illustration of their mannerisms from young Mei's mimicry of her sister both visually and orally as well as Satsuki's own mimicry of their mostly offscreen mother in a heartrending sequence when they walk with an extra umbrella in the rain to meet their father's late, late bus. 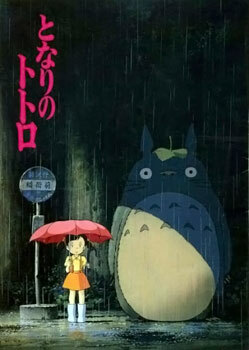 With exquisite animation that really taps right into nature complete with wind and the way that light goes through and bounces off elements along with effective use of shadows involving the girls, Totoro not only helped set the visual style of Miyazaki and Studio Ghibli's movies but also set the bar as the quintessential coming-of-age film, infused with love, imagination, and beauty.